It's a wonderful thing when you can look at the very beginning of a fighter's career and then look at where they're at now and the only thing you can say is "Wow, that's crazy!" 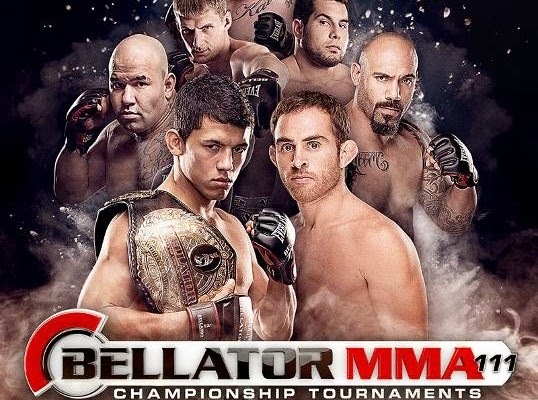 Such is the case with Anthony Leone, who had his first MMA fight ever at an UCL event at a grungy boxing gym in the South Bronx back in 2006, yet through a series of happy accidents is fighting in the main event of Bellator 111 tonight, taking on bantamweight champ Eduardo Dantas for the belt. You know what that is? Leone's career has certainly been a long and winding one with more than a few ups and downs. His first loss was in the WEC, against future UFC champ Renan Barao, and over the course of seven fights in 2010 and 2011, he went 2-5. But the New Yorker kept at it, and in his five fights since 2012 began, he's only lost once. The venue was John's Boxing Gym, a storied pugilist pit that reeked of old sweat and probably more than a few communicable diseases. But the crowd didn't seem to care about things like hepatitis and tuberculosis, they were into it because they'd come from Long Island to watch Craig Fields and brothers Anthony and Andrew Leone fight. Craig, you see, owned the KTFO MMA gym and clothing line, and this particular UCL installment was the chance for KTFO to, I don't know, earn street cred or something? Who knows. Andrew had no trouble taking his opponent down, getting mount, raining down punches and forcing him to tap in about a minute. His opponent, after all, never trained. Anthony on the other hand took on Richie Torres, and Richie was pretty seasoned and skilled at kickboxing. Therefore, it took almost three minutes for Anthony to repeat what his younger brother had done - which he did pretty much to a "T", earning the tap out due to strikes from the mount. In the main event, Craig lost a close decision to a male model and personal trainer named Mike Milian, with Mike's Jeet Kune Do arsenal proving to be a bit more effective than the wrestling skills (and only wrestling skills) Craig brought to the table. And that was it. Andrew went on to fight in ONE FC, Craig and his gym and clothing line faded into obscurity, and tonight we're going to watch Anthony on SpikeTV.